Japan's Princess Mako and her fiancé - a commoner - announced their engagement Sunday, a match which will cost the princess her royal status according to a law that highlights the male-dominated nature of Japan's monarchy. Like all female imperial family members, Mako, who is Emperor Akihito's eldest granddaughter, forfeits her status upon marriage to a commoner under a controversial tradition. The law does not apply to royal males. But at a televised press conference held to announce her engagement, she told the nation that she felt "really happy". "I was aware since my childhood that I'll leave a royal status once I marry," she said. "While I worked to help the emperor and fulfill duties as a royal family member as much as I can, I've been cherishing my own life." Her fiancé, Kei Komuro, a telegenic 25-year-old who works at a law firm and once won a tourism promotion contest to be crowned "Prince of the Sea", said he had proposed to her more than three years ago. He described Mako as someone who quietly watches over him "like the moon". The princess said his smile was "like the sun." The announcement had originally been planned for July but the couple decided to postpone it out of consideration for a southern region hit by heavy rains and flooding in the month. 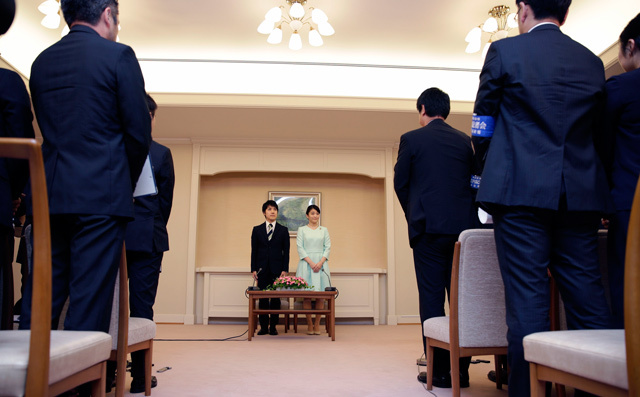 An official of the Imperial Household Agency said their wedding will take place after the summer of 2018. 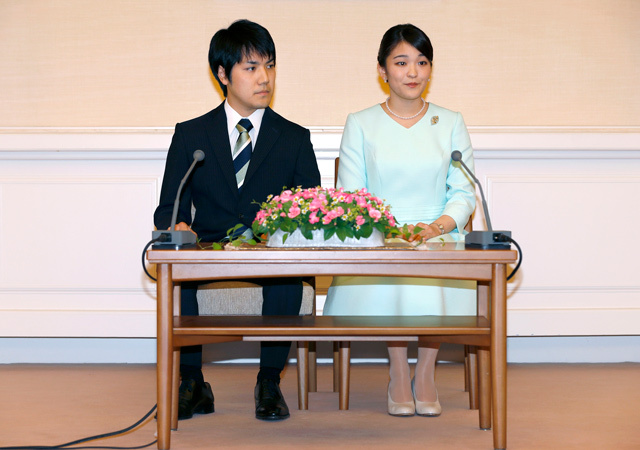 Mako, 25, is the eldest daughter of Prince Akishino, Akihito's second son. The law removing her royal status upon marriage does not apply to male royals, with Akihito and both his sons wedded to commoners, who are now part of the monarchy. That could help increase the number of potential male heirs to a monarchy that does not allow females to ascend the Chrysanthemum Throne. Traditionalists, including Prime Minister Shinzo Abe, strenuously oppose such changes, even though Japan has occasionally been ruled by female sovereigns in past centuries. In June, the parliament enacted legislation to allow Akihito, 83, to step down in favour of Naruhito, his eldest son. Emperor Akihito's retirement will be the first imperial abdication in more than two centuries. That will put his younger brother Akishino next in line, followed by Hisahito, Akishino's son. But after that there are no more eligible males, meaning the centuries-old succession would be broken if Hisahito fails to have a son in the future. Some have suggested returning royal status to families who were stripped of it under a sweeping reform during the US occupation of Japan after World War II.